So, while I was out cavorting this weekend (by which I mean, being gently baffled by nice Vietnamese ladies who insisted I have another piece of that pork thingy) a nice little show called Doctor Who or something had its premiere. How lovely. By which I mean that I was burning with fire and envy that I didn’t get to see it until this morning. Grr. But I have now seen it, and have an intense desire to go into the specifics of a certain character with you all. You know what I’m talking about. Or, alternately, if you don’t, stop reading. Now. “The Asylum of the Daleks” is a lovely romp of an episode that somehow manages to tackle very intense emotional issues without ever becoming melodramatic or irritating. IN my book, that’s pretty impressive. 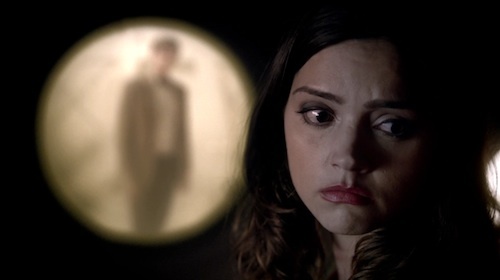 What I want to talk about is Oswin Oswald. Because she was fascinating. Just from a purely descriptive angle, Oswin is a fabulously interesting character. She’s brilliantly clever, delightfully playful, and horrifically delusional. In short, she’s complicated. I like complicated. Let’s start with the obvious important starting point: Oswin is a Dalek. She’s a Dalek who used to be a human, and clearly clung to that humanity with all her might, but she is a Dalek. From a writing standpoint, I really have to give Steven Moffat credit. The general Dalek storylines have got a bit tired, and this is a very cool way to liven things up a bit. So we have a character who is a Dalek but doesn’t think she’s a Dalek, and when she realizes it, she makes the decision to save the Doctor and sacrifice herself. That’s also rather interesting. Doctor Who is a show about humanity. Sure, its main character is a god-like figure who can barely grasp the concept anymore, but it’s a show that is primarily concerned with ordinary people doing extraordinary things. 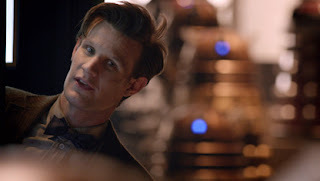 The Eleventh Doctor’s line, “In 900 years, I’ve never met anyone who wasn’t important before,” sums up the show nicely. There’s a reason why the Doctor always takes a human companion with him. In his reasoning, it’s because taking someone along when he visits places is a way to keep the wonder fresh. He’s so old and jaded that if he didn’t have awestruck friends to drag along, the whole thing would get dull very quickly. And as anyone who’s tried to watch a favorite movie by themselves, and then with a friend who’s never seen it can attest, it’s fun on your own. But it’s exciting when there’s someone else. So humanity and the having of it is very important to the Doctor. But it’s not just that. The Doctor is important to humanity. Not as a savior, even if he does save us rather often. We can save ourselves, we’re just not as good at it. Instead, the Doctor is important to humanity as a sort of goal. A great figure to look up and pray that we can someday be. How does all of this relate back to Oswin? Oswin stands at a very unique crossroads. On the one hand, she is human. Utterly human and more human than probably a lot of us. She is human because she believes she is human. She feels, she laughs, she cries. She is a person because she says she is. That in and of itself would be an interesting character, but there’s more. On the other side, Oswin is a Dalek. The thing that is the worst of humanity. Devoid of all emotions except hate, and all memories except those that are useful. Oswin’s not like that, no, but she has the potential to be. And, in a way, that makes her a very poignant message about humanity. Oswin wants to be human, but is torn between her Dalek nature urging her to destroy, and her human emotions that ask her to create. To burn soufflés or to kill the Doctor? She is the world standing at a crossroads. And when she decides to be human, fully, she makes the decision that we hope humanity will. Okay, that was a bit heavy, so I’ll break it down a little. Doctor Who has always been about the larger metaphor, right? The Daleks were conceived as sort of space Nazis, which makes sense since they appeared in British media in 1963. Nazis were still very much on everyone’s mind. The Doctor is a stand-in for the better us. The ubermensch, if you can stand Nietzche. And in between are the companions. Neither Dalek nor Time Lord, we little puny humans are left to make the choices. Do we want to be pacificists or aggressors? Do we hate our enemies or do we choose to love them? Which way are we going to go? Oswin is the extension of that conversation. Just as River, Rory, Donna, Rose, Martha, and Amy have been. Oswin is another iteration of the long conversation on what it means to be human. Oswin is human because she says she is. She is an important character because she’s taken the argument about what makes a person to a whole new level, and largely, created the ultimate answer for it. If you say you are human, who am I to say you’re not? "Instead, the Doctor is important to humanity as a sort of goal. A great figure to look up and pray that we can someday be." Oswin is fascinating, for all the reasons you say. And also because I'm pretty sure we've not seen the last of her. Jenna-Louise Coleman has been cast as the next companion, to appear after the Ponds make their departure - her name, Clara Oswin. To me, this is a Chekhov's Gun - Moffat writes the kind of stories where this stuff matters, and I'm expecting that the Doctor is going to go into some plan to save Dalek-Oswin from the middle of that inferno - or else she's going to find a way to escape (hack that transmat beam, get it to pick her up, and put her down someplace else maybe). And what I'm really hoping for is that Dalek-Oswin will be traveling with the Doctor - perhaps with him using Clara Oswin's DNA to build her a Flesh-dupe body (as in those from the Almost People) that she can remote-walk-around in. Because Oswin *is* a Dalek, as well as a human. And that makes her possibly the only person who can actually *test* the Doctor's faith in people's ability to be their best selves. My guess on the Oswin coming back as a companion thing is that the Doctor is going to pop into her life earlier in her timeline, a la River Song. It makes a very nice paradox for him, where if he saves her, then he undoes the immense favor she did him. And rewrites history a bit. Anyway, that's where I hope they're going with it. I love me a dilemma. I have to say, I did NOT expect her to die at the end of this episode, and then I did NOT expect her to die at the end of the Christmas special. Then I gave up all hope of figuring it out ahead of time this season and just rolled with the punches. I had feelings about this past season. Lots of feelings. Most of them, sadly, kind of negative. I do still love this episode, though. 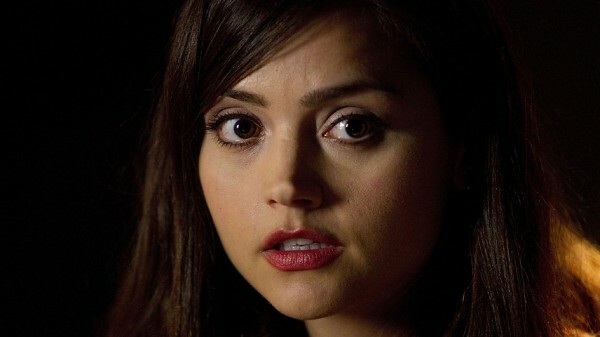 Since it's by far the most engaging version of Oswin we meet, and was one of the best episodes this past season. I'm very curious to see what's going to happen when Peter Capaldi comes on board. Because I love love love him.